So we mournfully kissed away summer and are dubiously standing on the threshold of autumn. Think crisp, clear mornings with silvery air mingled with the woody smoke of bonfires. We are met with the reality of slanting rain and mud streaked across floorboards. Think Beechams cold and Flu. Luckily I seem to be the sort of person that has a yearlong Autumnal wardrobe. I own one pair of shorts and ten knitted jumpers. I wear knee boots in 25 degrees. It seems I have become my mother. One key item that will likely be on most mums clothes ‘want list’ in September is a coat. You can wear your pyjamas on the school run and no one will know. No one looks slender in a coat. We all look like we are wearing sleeping bags even if ones waist is a size six. Ha, I will have another biscuit thank you autumn. Coats offer lots of extra material for when you need to mop something up or wipe dribble off your offspring. Looking chic, keeping comfy & feeling warm is almost as difficult as trying to explain evolution to a 5 year old. Choosing a good coat can be a tricky task, do you go bold, pattern, zip up or toggle? As a mum I have written off beige or white coats. With the best stain remover in the world they just do not survive the sticky fingers and muddy puddles. Black is slimming but will be covered in dog hair in three seconds and for mummies with baby’s, sick is not a complimentary colour to black. Above: Two gorgeous lapel collar, maxi, straight length coats from ASOS. Mustard is my favourite colour, shortly followed by deep reds which go well with my hair colour. If your a redhead forest greens look striking. For darker skin tones go for the bold, bright colours which remind us that we will see the sun again! Although I am short, long coats are my top choice because my legs get cold and they are better for when pretending to be Batman. Which is surprisingly often. 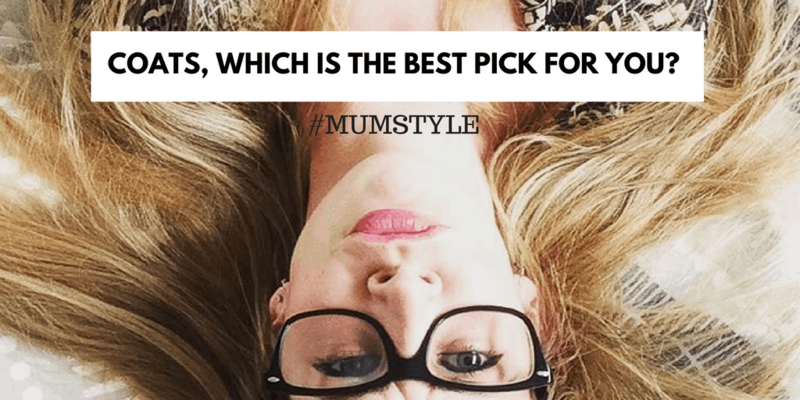 Mums seek something stylish enough to cover up that we have only slept for two hours! Above left: Selected Femme modern monochrome design. Above right: Yumi oversized checked coat. I love how eye catching patterned coats are but stuck with a good ‘all rounder’ and went with a simple graphit Kiomi jacket this year. It matches my umbrella which is an important achievement in life. (See top picture). Buy what you feel comfortable in! A couple of years ago I treated myself to an expensive garment, woollen, beautiful, fit for a goddess…and my son put play dough in the pockets. His addiction to overpriced hot wheels means mummy’s bank account demands she be as thrifty as possible when purchasing clothes. Also, the fact I always have a whingey boy in tow means most of the shopping I do nowadays is online. Talking of a bargain. This beautiful black and white Leaf print dress was from Yumi through Love the Sales. It was half price AND fits perfectly with the Jungle theme, hence why I had to take so many silly selfies. Next on my autumn wardrobe list is BOOTS. I really want to get my hands on some UGGs, lucky for me there is always an UGG sale going on somewhere! All coats above were sourced via LoveTheSales. Oh I love those long coats if only I wasn’t so short and frumpy. Aarrgghh I hate the annual winter coat buying session! Being short I never suit the coats I love and whilst I always want a really warm and snug coat, I tend to look like an oompa loompa!